For great service, great prices, and great car audio video, you can’t beat Mega Watt Car Stereo and Security. 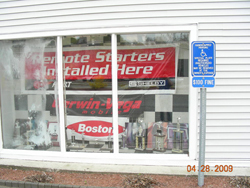 We’re a locally owned mobile electronics shop with over 15 years in the business: from our MECP certified installers to our expert sales staff to our awesome Sound Room, Mega Watt Car Stereo and Security is the car customization shop you’ve been looking for. We serve the mobile audio video and security needs of both individuals and dealers. If the dealers trust us for top-quality, professional work and fabulous prices, so should you! The Mega Watt Car Stereo and Security Sound Room is the focal point of our shop–and what sets us above the competition. This awesome demo room allows you to switch between a variety of CD players, speakers, amps, and subwoofers to create a truly customized sound. You can even try out satellite radio! With 16 subs and 1600 watts of amp powering the system, you can get the volume you want to hear! By enabling you to create customized configurations, our Sound Room allows you to design the perfect sound system for your taste and listening style. 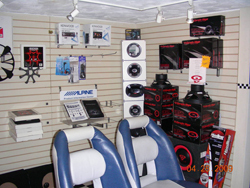 Drop by our car audio shop today to experience the difference our Sound Room makes. You can even bring your own music to play! At Mega Watt Car Stereo and Security, we use MECP certified installers for all of our mobile electronics installations. 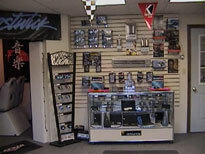 Unlike fly-by-night car audio shops, we don’t let amateurs work on your vehicle. Our MECP certified installation technicians have the credentials, competence, and expertise to effectively and completely install your mobile audio video system or vehicle security features. When you trust Mega Watt Car Stereo and Security for your aftermarket electronics sales and installation, you can be confident in superior workmanship and a top-quality installation! We offer complete custom car audio video installation, including subwoofer boxes, fiberglass, custom dashboards, and custom upholstery. Mega Watt Car Stereo and Security also offers several car customization services, including window tinting, truck accessories, and wheels and rims. Drop by our shop to check out our selection and place your order today. We’ll help make your car or truck look as hot as it sounds!